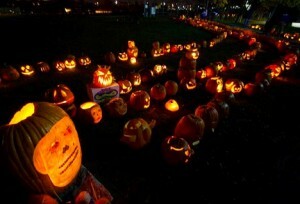 Everyone knows about Manhattan’s crazy Halloween party, New York’s Village Halloween Parade. Line up on 6th Avenue South of Spring Street and North of Canal Street at 6:30 pm and be prepared for a ghoulishly creative fest that tops anything throughout the country… with lots and lots and lots of people. Haunted Lantern Tours: Dress warmly and look out for the headless horsemen out there as you join the Urban Park Rangers for a lantern tour of the historic Water Battery at Fort Totten in Queens. The tour is from 6:30pm-8:30pm on Friday, October 29th. Thriller at the Battery: Add some time before or after your lantern tour and check out Thriller at the Battery, at the Fort Totten Visitor's Center. Bring your flashlight and explore a haunted shipwreck that comes to the park every Halloween. The tour is also from 6:30pm-8:30pm on Friday, October 29th. BAMboo! : Brooklyn Academy of Music, America's oldest continuously operating performing arts center founded in 1861, celebrates its ninth annual Halloween festival. Get the requisite trick-or-treating out of the way and continue your afternoon of fun at BAM with candy giveaways, costume contests, storytelling, a haunted house maze, roaming entertainers, games, and more. This free event is from 2-5pm on October 31. Howl-o-ween: Dress your pooch up on October 31 and bring him or her to Canine Court in Van Cortlandt Park at Noon to compete in the annual costume competition and dog frolic. Registration is $10 per dog and $5 for each additional dog and benefits the dog run. Thriller on the Bronx River: If trick-or-treating or parades aren't your thing, you can still spend the day outdoors. For an awesome alternative celebration, head up to 219th Street in your costume where you will begin your adventure canoeing through the Bronx River Forest past the Botanical Garden, ending up at the Bronx Zoo. Stay in your costume (if you haven't gotten wet from the ghouls and ghosts along the river) for the Halloween party at River Park in West Farms where you will enjoy a guided walk of a local cemetery and hear ghost stories. *You must register if you would like to canoe in costume from 1130am-2pm at http://thrillerbxriver.eventbrite.com/ Canoe tickets start at $20. World Financial Center’s Screamin’ Green Halloween: This year go green for Halloween at the World Financial Center on October 30 from 12-4pm. Learn the true meaning behind “reduce, reuse, recycle” as artist-educators teach how to make fun costumes and masks with recycled materials or exchange last year’s costume for a new one at the Costume Swap. Test your bean toss skills at “Toss a Spider in the Brew” or your bowling skills at “Bowling for Ghosts” where players will aim to knock down repurposed soda bottles as pins. Don’t forget to go bobbing for apples either! Scared of Sunday’s crowds in The Village? Send the kids off in one of the mini parades led by the Hungry March Band at 1, 2, or 3pm. Leave the car keys and your subway passes behind and instead ride your bike to the event and enjoy free valet bicycle parking. Boo at the Zoo: Hay mazes and pumpkin carving may be the norm for Halloween, but how about adding a Haunted Safari to this year’s celebrations? 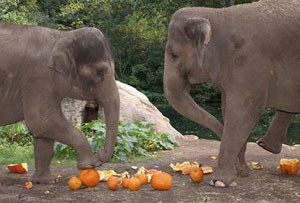 Head to the Bronx Zoo this weekend (October 30-31) for a series of events that will leave kids screaming for more. Better yet, children ages 3-12 in costume will receive a free child’s admission with the purchase of a full-priced adult ticket. Costume Parade: Show off your best costume as you march from Dancing Crane Plaza to the Grizzly Goodies Picnic Area to the tunes of Gigi and the Lend Me a Hand Band at 12:45pm or 2:45pm. On October 24th, join two cast members from Broadway’s The Addams Family in a special costume parade at 11:30am. Extinct Animal Graveyard: Feel the spooks as you visit Mouse House lawn and learn about the endangered and extinct animals in the display. This entry was posted on Wednesday, October 27th, 2010 at 9:37 pm	and is filed under Stuff to Do. You can follow any responses to this entry through the RSS 2.0 feed. You can leave a response, or trackback from your own site. Brilliant holiday article! About to add it to my RSS Reader! Thanks!